What inspires you? brought to us by Shelly of Pics by Shel. A very tricky question indeed, since I have been "under the weather" this week both literally and figuratively and haven't been too inspired at all. 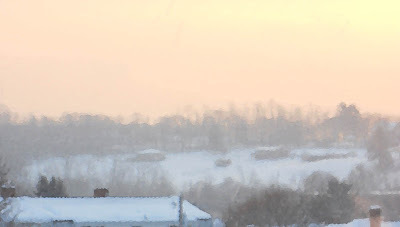 early morning, snowy, serene, looking over the rooftops of our little town. Just on the other side of those trees is the mall and the hustle and bustle of Route 30. But it's much more inspiring to add a little photoshop filter and imagine it's an impressionistic painting by one of my favorite artists...maybe Monet...it's a little too serene for Van Gogh. 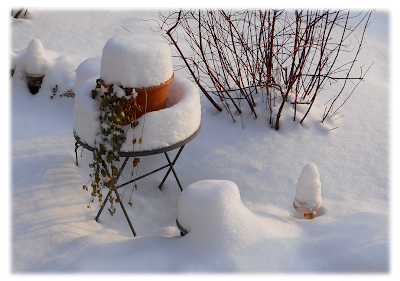 I'm surprised I'm even showing you this, I was a very bad gardener and forgot to clean up my pots for the winter. I do like the way the garden light has grown a mushroom cap! Inside, is quite a contrast. Being sick with a nasty cold is the perfect excuse to accomplish very little besides reading books. I've become addicted to Philippa Gregory's books. Luckily, she's written many of them! No chance of running out soon! 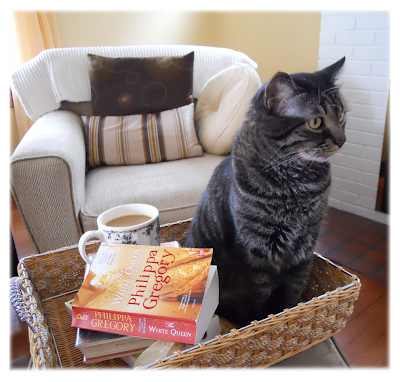 Here is my cohort Oliver, who likes neither coffee nor books, but never passes up a chance to sit in a basket. In fact, he's been very uncomplimentary about my choice of reading material. "*sniff* yes I read that...I was not impressed. Her historical facts are inaccurate. Tsk tsk," he said. So, I'll stay immersed in Tudor England for a while longer. I'm actually feeling a bit better but I'm practicing my sniffles and sneezes in order to stay under the covers a little longer. If you like historical novels, here are a few others I've read, and they kept me thoroughly engrossed. The Other Boleyn Girl, the story of Mary Boleyn, Anne's sister; The Red Queen, the story of Margaret Beaufort, the mother of Henry VII; The Constant Princess, the story of Katherine of Aragon; and The White Queen, (from her series The Cousins' War about the Wars of the Roses) the story of Elizabeth Woodville, the mother of Queen Elizabeth who was married to Henry VII. I cannot remember whether book titles are to be boldface, underlined, or italic, something that concerned me in my graphic design days, but which I am happily uncaring of now, heehee. So if I got it wrong, sorry! If you let me know, I'll fix it...see, I do still care! Take a moment to visit Inspiration Avenue here to see the entries in the challenge for this week. Take a peek at what inspires creative people! You still have time to enter your own "inspiration" for this week ~ and you'll be entered in the monthly drawing as a bonus incentive! Oh you have caught the essence of Monet perfectly! Or as Oliver might say, purrfectly! 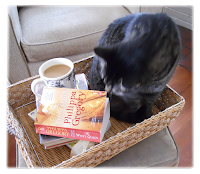 I love Philippa Gregory, tho' I've only read a couple of her books! One of my most recent favorite finds was C.S. Harris's Sebastian Cyr mystery series set in London's 1800's. Really any well written historical novel is good in my opinion! Well I am sorry to hear you've been ill but at least it gave you the opportunity for a spot of time travel. That snow is incredible. My boyfriend thought it looked like a Victorian lady's hat! Sorry to hear you have been under the weather. Happy New Year, Maggie - so sorry that you're starting it out with a winter cold. Ugh! Although, I've always thought that colds were our body's way of allowing us to snuggle in and rest (and read several good books). Your reference to Monet made me see your photo in another way ... I love that! Get better soon ... or at least when you're tired of reading. Oh, I love your pictures--and your kitty is SOOOO adorable!!! I hope you're having a good weekend and having fun reading! Sorry to hear you're not up to snuff. I never met a cat that wouldn't sit in a basket or other enclosed container. Hope you are feeling better soon Maggie! Or not **wink** You chair and ottoman look quite cozy. You may need more rest. Enjoy your book and java. What a lovely airy photo - it is very impressionistic, actually reminds me a little of Turner's watercolour skies too! 1. What a beautiful photo...makes winter seem (almost) charming. 2. 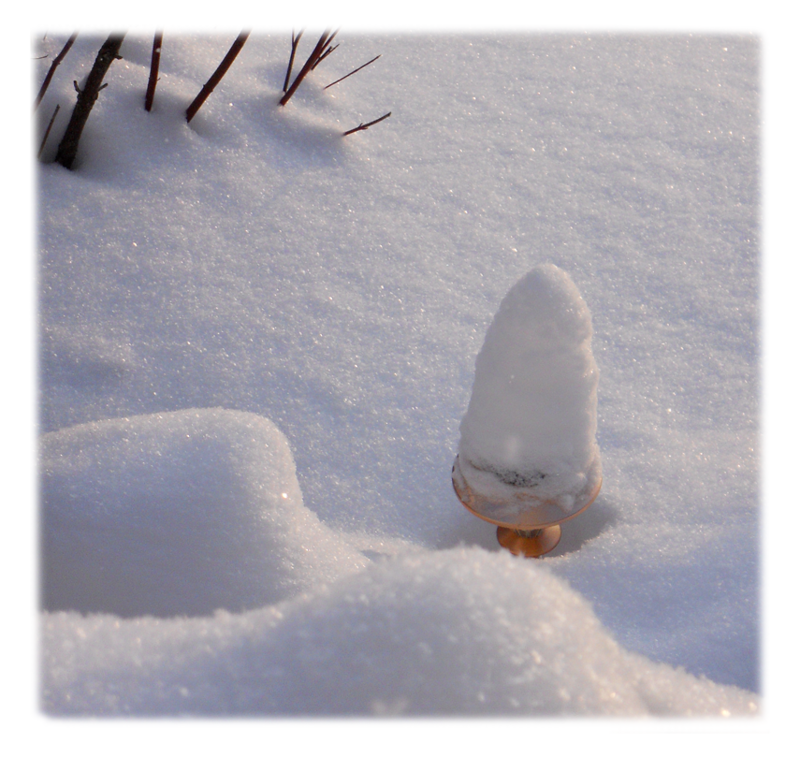 The only thing good about snow is...it's like puttin a blanket over all the unfinished gardening and unraked leaves. 3. 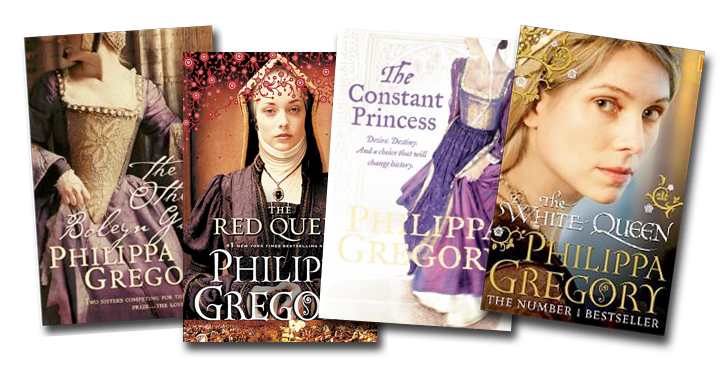 Philippa Gregory is amazing! One of my favorites...but once you get caught up on all her books, you'll be like me...sending her subliminal messages like: Write, woman, write faster! So sorry to hear you are not feeling well. I hope you get better soon. 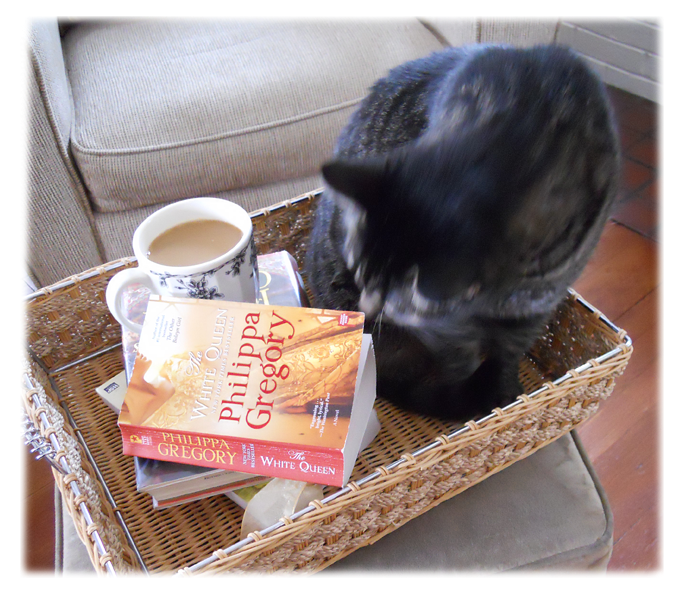 I love Phillipa Gregory too. I've read the Other Boleyn girl. loved it. So much better then the movie. I don't know about you but I want to hibernate all winter. Haven't been too inspired either. I'm glad you've got a cozy spot with good reads while you feel sniffley. I just started reading Philippa Gregory a couple years ago and love her so much, too. I guess I'll have to add Phillippa Gregory to my list. And your 3rd floor view is lovely! Sorry you are under the weather hope your feeling better now!! Love the impressionistic snow scene, and agree with Angie it does look like Turner's skies which are totally amazing! 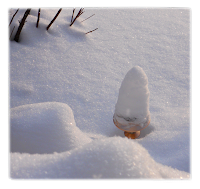 I Love your little snow mushroom, I just love the way the snow can find the tiniest thing and make it look amazing! Our snow seemed along time ago but I won't hold my breathe as I'm sure it could be back anytime!! As for Oliver, aren't cats funny, mine curled up in a carrier bag once and went to sleep, I was wrapping christmas presents at the time and when I picked all the empty bags to clear them away found one was still occupied!!!!! They are such characters, she sadly is no longer with us!! Pittsburgh's Going to the Super Bowl!